Although this website has not been updated in awhile, they are still in fact an organization and fly ball team in OC that is operating and testing their dogs skills in tournaments. Their practices are held every Tuesday night from 6:30pm to 8:30pm at The Irvine Animal Care Center. They attend most of the flyball competitions in the SouthWest US. "Jump Start Dog Sports is pleased to offer a variety of classes for all dogs from puppy awareness workshops to the highest level of competition in agility and obedience. We have seven main divisions of classes � Family Pet, Agility, Competition Obedience, Rally Obedience, Freestyle, Conformation Handling and Handler Conditioning." This is a dog agility club in Southern California with members consisting of agility enthusiasts at all levels of competition. The website denotes plenty of upcoming events and dog agility training sessions as well in Orange County and surrounding areas. Take a peek at their fun photos of flying pups on the site too. Flyball and agility team in Orange County, CA. that operates out of Garden Grove but competes in many of the SouthWestern States. Founded in 1996, they have gained quite a few flyball tournament devotees and plenty of quick pups to boot. The website also explains flyball rules, how it is and the points awarded to the dogs. "Located in Acton, Los Angeles just outside the Antelope Valley, in Southern California, Fleet Feet Agility Center welcomes all dogs to participate in its Agility classes. Dogs & handlers train on regulation equipment, in small, ongoing classes and progress at their own speed." They have all kinds of experience in training your next agility dog. "We are a Dog Flyball Club in the South Bay area of LA. Agility, Obedience & Conformation all have numerous local locations, but there hasn�t been a Dog Flyball club. Foe Paw is the answer to the 45-minute commute to other �local� Flyball teams. Now dogs in Torrance, San Pedro, Redondo Beach, El Segundo, Hawthorne, Lawndale + have a place train." Although the website has not been updated in ssome time from the looks of it, this La based Flyball Club and team apparently is going strong. Do yourself a favor and check out all the many, many phenomenal photos taken of some of the teams recent dog agility tournaments. These dogs are born to fly! "During the 5 week beginning classes you�ll be introduced to the basic agility equipment & the proper execution of each obstacle. Beginning with ground exercises; introduction of jumping techniques & how to properly and safely negotiate contact obstacles. Beginner through advanced levels of training as well as puppy introduction classes at times." Dog agilty classes are for all levels are held during the day and evening hours. Private dog agility lessons are also offered upon request & availability. Classes are held on 2 acres of grass & is surrounded by beautiful farm land away from the city. Happy Dog Agility offers classes for all levels: beginning to Masters agility & puppy classes. "Our flyball agility dog team was founded by a small group of dog lovers with a competitive spirit and a focus on having fun. The website shows pictures of the team as well as the dog racers in action. Some fast pups here, boy! Explanations of the flyball sport as well. ACE Dog Sports is offering classes at Shamrock Ranch in Pacifica, near San Francisco & in Brisbane at 362 Industiral Way. This website has a VERY informative test that dog owners can read through that helps determine if your dog is ready to start agility classes. Off leash obedience skills & a unity with your dog are needed to pursue agility. Wow, a great looking company that offers more sporting types of activities and classes specifically for dogs than you can shake a stick at! The Herding Classes are individual private lessons taught in pens, arenas & open fields contingent on the handler�s & dog�s abilities. They also have proven agility, flyball and earthdog training. Updated website discusses their dog agility racing team�s accomplishments, training seminars for dogs and handlers, past trials and more. "We currently sponsor USDAA and AKC trials as well as offering seminars and clinics on agility training." Plenty of great dog agility classes here located in San Diego, Escondido. You can read through some of the suggestions and ways in which to distinguish whether your dogs are ready for agility training with them. From beginner to advanced, they have what your dogs yearn for. Photos of the beautiful field are shown. "Our chief goal is to have fun! We also want ourselves and our dogs to be the best that they can be. We may not be a Division 1 contender, but we constantly work on improving what we do and going for clean runs. We strive for good sportsmanship and good communication with our dogs. We are constantly working on improved reliability." Unleased Furry is a young and growing Flyball Club in San Diego, Southern California who would love to see you come out and support there canine pals at tournaments. " Our team�s main goal is to work with our pets in order to develop both their skills, and our own, in the sport of flyball." Give them a call to involve your dogs in their practices. This is a San Fernando Valley area based flyball team. Although their canine website has not been updated in some time, it does state that Practices are held every Sunday morning at 9:00am at Chatsworth Oaks Park, Chatsworth, CA. Some of the best dog tricks training available in CA. by celebrity canine trick trainer Kyra Sundance & Chalcy! This woman and her dogs have perfomed on dozens of TV shows. Be sure to check out her other website chalcy.com to find out all her upcoming dog trining classes and scheduled appearances on tv. Not to be missed. This Big Bear Lake dog club is unique in that they are not at all interested in "showing" their dogs or breeding, but gather to be involved in group dog activities. They gather to use their Siberian Huskys for Dog Sledding, Skijoring, Carting, and Hiking. They also enjoy gathering with their four legged friends for biking, camping and more. 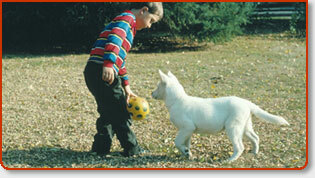 They provide private & semi-private canine agility training for just about any kind of dog & its handler. Whether you are looking to compete at the highest level, be a weekend warrior or just relax and have fun with your pup, Turn-N-Burn will work with you and your best 4-legged friend to achieve your agility and training goals. Rock�N�Rovers is there dog flyball team. But they meet with their dogs for a whole host of fun activities including local demonstrations, competitions and fun matches. Over the years, the club has grown and other dog sports such as flyball, obedience and frisbee competitions have been added to WVDS repertoire. Over a 100 members. Whether you are just beginning in agility classes or are already a seasoned tournament competitor, Ups �N Downs Agility Club has something for everyone. K9 Training classes are offered at all levels; from beginning obstacle training to master�s handling. They have plenty of info on how to become a member as well as a chat room to stay connected. You can find an excellent description of exactly what "Flyball" is, how it is competed in and the rules and points of the tournament. They have information on their upcoming flyball competions in San Diego and surrounding areas of California, etc. Ann Croft offers classes & lessons at the Markim Pet Resort in Carmel Valley, CA. She has all the dog equipment specifically built for agility training you can shake a stick at. Are you a dog agility enthusiast? Ann can help you take your dog�s skills to the next level with her advanced placement seminars & private instruction. Dedicated to keeping the sport fast and fun for competitors and recreational students alike, Jump City Canine Agility is a training center dedicated to the sport of dog agility training. They offer group and private classes to dogs & handlers at every level. Workshops on various agility-related topics, and seminars by national top trainers. Membership in this agility group now exceeds 100. Site has membership info as well as discounted benefits for group members. They offer dog agility training to all levels of dogs and their owners. Very updated calender of events. They have and excellent library vault of dog agility specific topics that have been written by experts in the field. Dog Agility classes sepcifically tailored for novice dogs and their handlers is available in Temecula, Riverside County Southern CA with trainer Cindy Dahlberg. The website has a few arial photos of her outdoor dog training center. She diligently has posted all of the upcoming training classes and how many spots remain open. Agility Trials, Matches, and Show-n-Go�s! Great website that discusses the rules of dog agility competition. Offering classes for each level of agility enthusiasts, from first timers through dedicated competitor. Dog agility is rapidly becoming the most popular dog activity in the world & they offer an ideal venue to learn this exciting new sport. "Kathy offers PRIVATE LESSONS FOR BEGINNERS OR EXPERIENCED DOGS in Agility, Obedience for Agility, Jumping for Agility or Games for Agility. Kathy holds Agility Evaluations for dogs and handlers of all levels. During the evaluation she assesses Agility teams in several areas of expertise and advises of strengths or weakness." "DrivenDogs currently offers Groups Classes, Private and Semi-Private Agility Instruction as well as travels to teach Agility Seminars. At DrivenDogs we instruct beginning thru masters level students." Group agility training classes are also available for you and your dogs in Camarillo Ventura, California (Freedom Park and Green House).